I had already invented a historic house for my murder. It dated to pre-Revolutionary times. I knew how it had begun –smallish, built by a hard-working tiller of the stony New Hampshire soil – and how it had grown as the family prospered. The foursquare, four-room shelter expanded, front, back and sides, as the nineteenth century progressed. The second story lost its sloping bedrooms and acquired an attic. Greek Revival doohickeys appeared. Even the sheds and barn grew neat. This week, I got a chance to visit the kernel of my mysterious house. A kindly neighbor is selling his 1775 farmhouse, and he gave me a royal tour. I found myself regretting that I had allowed my fictional Stark House to be tinkered with by a bunch of equally fictional ancestors. We stepped from the narrow front porch into a graceful swirl of centuries. A narrow wooden staircase on the left of the hall was painted in a deep, vivid blue, like the rich colors that once graced Mount Vernon. The paper on the walls reminded me of the papers Americans imported in the eighteen hundreds, when they established themselves among the nations — as consumers with the best of them. To either side of the hall were parlors, each with its fireplace, rooms deliberately kept small to conserve heat and prevent drafts. 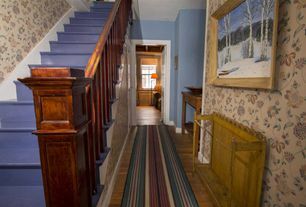 There were signs of new prosperity here, too: the wood-paneled walls may have been the work of a carpenter known to have come through town in the 1830s. He dressed up a number of the local houses – no one wanted to be left behind the fashion. My neighbor had stripped off the centuries of paint that disguised it; you can now stroke the original wood of this 19th-century upgrade. 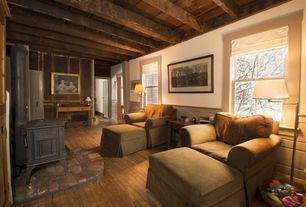 Behind the smaller parlor was the “warming room.” It shared a chimney with the large kitchen behind the company rooms. Here babies came into the world and the old left it, tended by the women of the family as they kept the kitchen fire going and the stew on the simmer. Our woods here in the Upper Valley still grow good lumber, but the trees that provided its wide floor boards and the original rafters above the kitchen are no more. 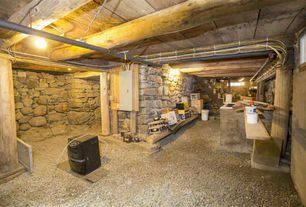 When we made our way down to the basement, I knew that I had missed a great opportunity for my fictional Stark House. Its walls were made of fieldstone, like the walls that run through all our woods and pastures here, but with a big difference. These had been matched and placed with such care and skill that the corners were militarily precise. Just over our heads – we’re both about middle height – huge wooden beams lowered over us. Many had been replaced over the years, but some were still unsquared trunks from those ancestral forests. Think what crimes I could have committed – and concealed! — in such a basement. Just a little monkeying with the light fixtures…. Outside, under the lawn, there are signs of another foundation, probably the barn. 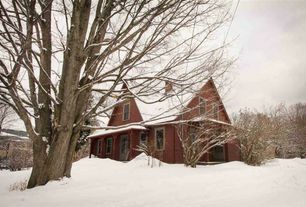 I ached to know whether it had once been connected to the house by sheds and work buildings in the style known as Big-House-Little-House-Back-House-Barn. Those convoluted connections figure largely in my murders. I can see that I’ll have to write a sequel, if only to add the counterpart of this lovely place to my fictional Oxbow, New Hampshire. I'm currently writing a mystery that takes place in New Hampshire and a novel about an artist who's working in Ireland and Hell. Former incarnations: stock market economist and professor of Greek. Go figure. Posted on May 3, 2018, in Heidi Wilson, location, New Hampshire, Uncategorized and tagged 1775, farm house, Haverhill NH, New England architecture. Bookmark the permalink. 2 Comments. Thank you for the peek into this historic home. You’re welcome! The owners recently sold it to another antique home lover like you!